We just wanted to give a quick update! You can now purchase from our store using Amazon Payments. 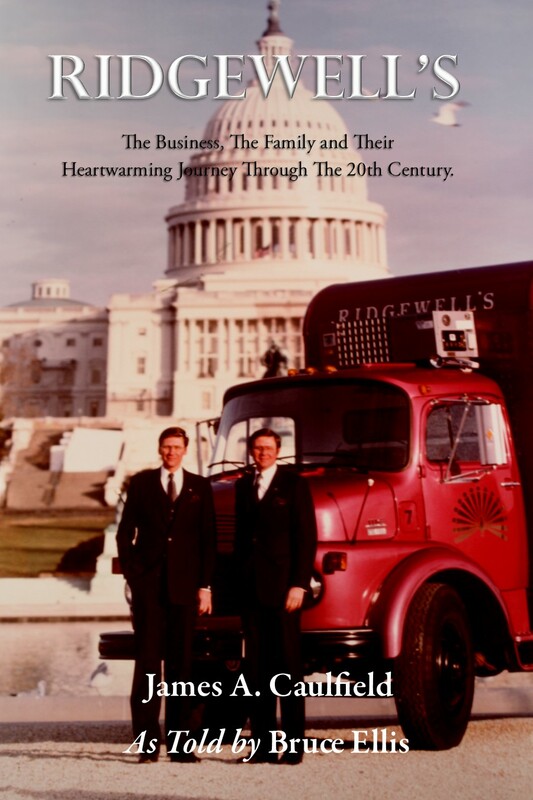 Head on over to Ink Smith Publishing’s website today! It’s Monday. 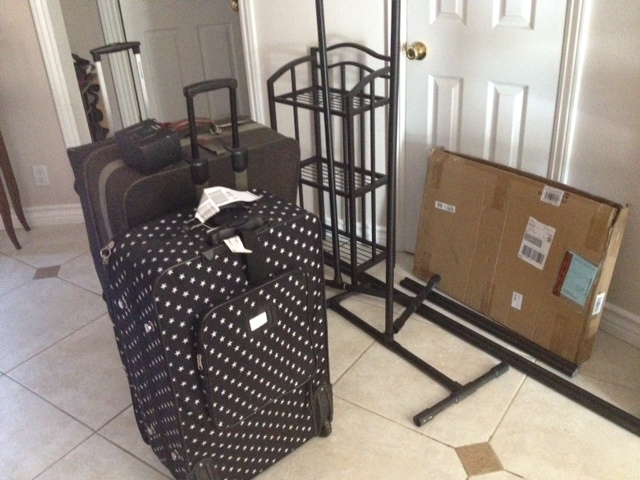 That means I only have tonight, tomorrow morning and evening and Wednesday to finish up what ever I have left before we go to setup at the Anaheim Convention Center. That isn’t very much time given I will also be studying for my Real Estate License Exam that I will be taking on Wednesday. I don’t know what I was thinking when I scheduled the exam for this week and not next! The combination of stress from both has negated each other I am afraid. Which has left me in a state of feeling at peace even though there is still stuff to be done and information to learn! I took some pictures today. I thought I’d have some fun with these updates. Today was crunch time. This weekend I spent most of the time listening to the sounds of my printer dancing back and forth to the printing of book catalogs. I did about 200 catalogs and almost emptied my ink cartridges. In retrospect, using a company like uprinting.com would have cost me into the $400s+. $16 dollars For 2,500 sheets of paper (in which I didn’t even use half of that) + 76 for the ink (mainly two colors are depleted). I am tempted to print up another 100 catalogs. I noticed a spark in eBook sales after Condor 21 with our catalogs. It might be worth it. I was in the process of putting them together. They are missing their final touches in this picture! Today however, I did more merch. 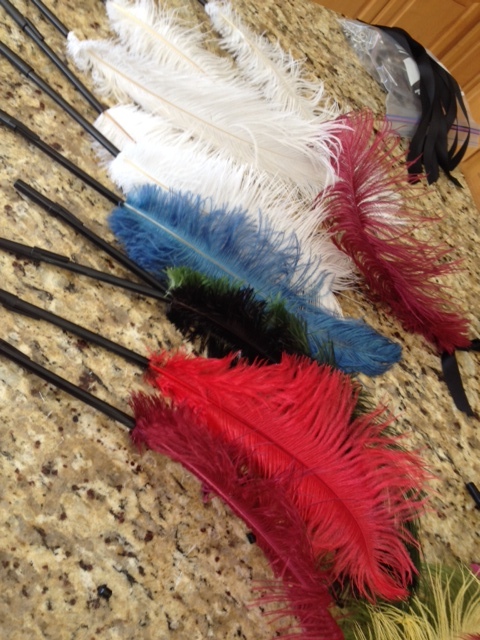 I finished the feather pens that had taken me so long to finish because of my schedule. I hand dye my own ostrich feathers. Usually I make the feathers for my hats for the Renaissance Faire, but I’ve decided to make feather pens with them… considering our logo is a quill.. I thought it would be fun and relevant! I’m pretty happy with how they turned out and I hope you like them too! I will have them on Etsy after this weekend for about 7-8 dollars each. I was going to stick to red, black, and white feathers but I figured that people might want other colors. I also put the final touches on the book bags that I have been working very hard on. 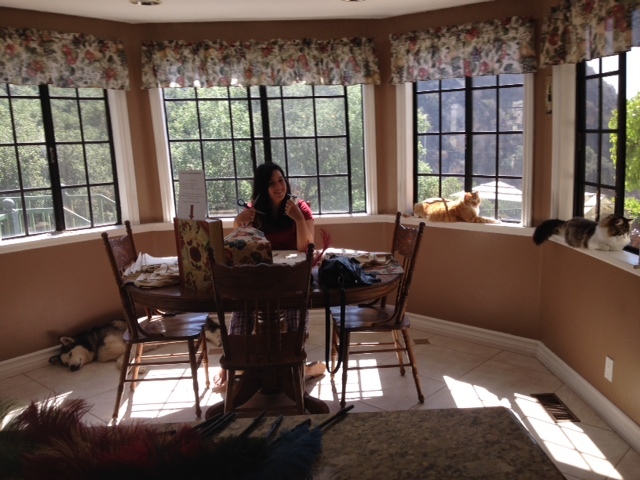 I had my team of minions to help me this morning. So the feather pens are done, although I could do more plain white feathers if I got enough feed back suggesting that I should. The book bags are complete. I did 55 of them. The poles are painted and the last of the signs have been printed. This is the final stretch! Now my list stands at finishing putting the giant book covers on poster board, cutting them evenly, and packing. Of course I may be doing more catalogs and feathers, but that is yet to be determined. The advice I have received on Reddit has been wonderful! Thank you to all those who have commented, helped, and suggested what to do. I feel that this is going to be a great event. I am so excited! 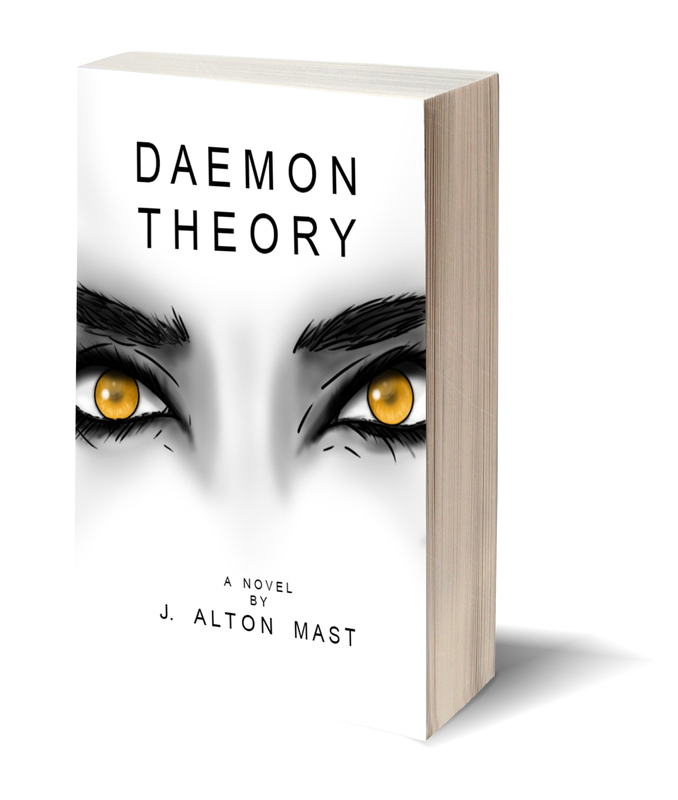 Maye Holloway, a young woman of barely seventeen, has been unwillingly thrust into the dark world of the Daemons who control her people, slowly learning their horrific secrets. Maye’s sole desire is to break free of Daemonkind’s wretched hold on her soul, with her life intact. Though the fates have a different plan for the girl, and her monstrous partner, an enigmatic Arch-Demon with a questionable past of her own, Alecko vi Fenris. However, Alecko’s motives are as vague as she is, and Maye begins to question who her biggest enemy is: The Order, Alecko, or herself. I’ve decided to “journal” the next 14 days as we get ready for Wondercon 2014. If you don’t know what Wondercon is, then listen up! Wondercon is hosted by the same company who puts on the giant Comic Con in San Diego California. It is smaller compared to the 120K who attend Comic Con. About 50-60K will be in attendance at Wondercon, or maybe more! They seem to be growing every year. Up until now, Ink Smith has only attended small book fairs. Condor 21 which was our first experience at a “con” vention had about 650 people in attendance. To our surprise we sold out of a few books and sold several book bags. Now my dilemma is this: What to expect at an event with attendance in the thousands? I am in the process of putting the book order together, but I don’t want to over order. I also definitely don’t want to sell out of items on the first day. Ideally if someone has had experience with this kind of thing I would love your input! I currently have on order 15 copies of those books that I sold out of, 10 books of those that sold one or have previously been popular at book events, and 5 of those who haven’t really drawn much attention at events. I also am planning to have 40-50 book bags for sale as well. I was told to order about 300 books for this event, but I’m a little uneasy about order that many books. On that note, we will be at other events this year. So extra books wouldn’t be an issue either. Or should I order more? I also will be selling Quill pens as well that I have been hand dying and making myself. I will only have a select amount of those there as time keeps eluding me. Our position is in the back left corner. I have plans to over come this obstacle, although I’ve been told that being in the corner might be a good thing. So thoughts? What should I do? How many should I order? Advice? It’s been awhile since we’ve called for submissions. We are currently looking for books to fill our 2014 and 2015 calendar! We are looking for anything but religious, political and romance novels. We do tend to focus on sci-fi, fantasy and horror novels but we are hoping to expand our catalog for the end of the year with different… unique novels. If you think you have a story that we may be interested, please check out our submission page and guidelines! Let us know you found this submission calling at The Inkwell and Quill. 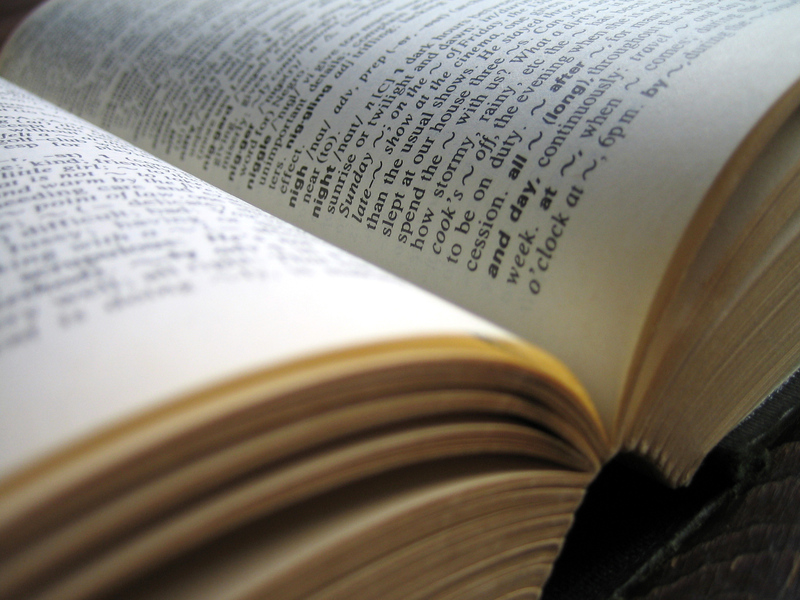 Have a non-fiction or a children’s book? 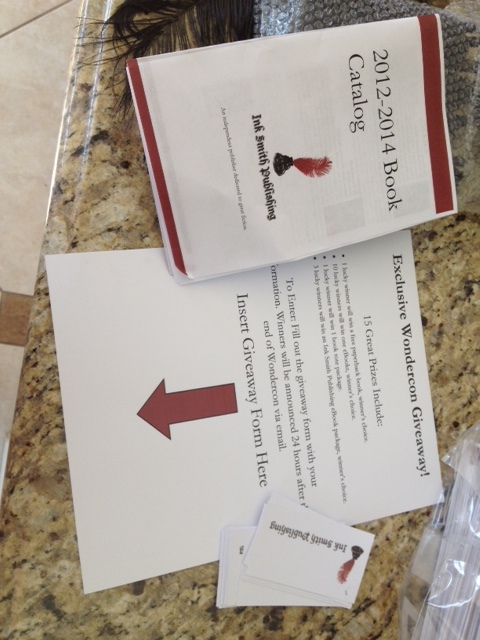 Check out our imprint, Native Ink Press, as they are also looking for 2014-2015 novels for their calendar! That’s right! This isn’t an April Fools joke. The new featured book of the month is now up for download at our book club. 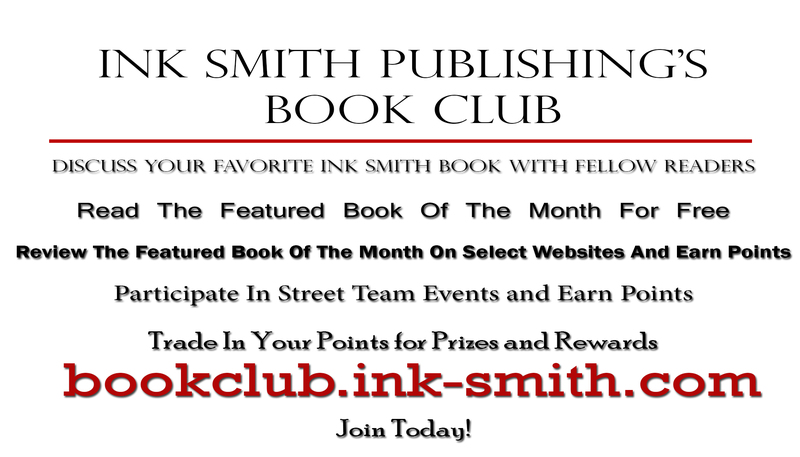 If you are already a member just head on over to bookclub.ink-smith.com and login. If you aren’t a member, what are you waiting for! Joining the book club is free. You get the featured book of the month for FREE! You can earn “cash” for your reviews and street team activities. You can also get “cash” from your friends! Refer your friends and when they join you’ll earn points. We have added new street team activities. We will be adding more gift cards and prizes that you can redeem.